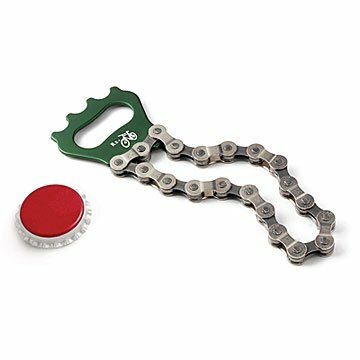 Designed and manufactured in Oregon, this flexible bottle opener is made from an upcycled bike chain. Graham Bergh and his team of gifted artisans in Mosier, Oregon make an amazing range of funky household items from tons of recycled bike parts. Each month they collect 3,000 pounds of used parts, drawing from 150 shops in 17 states. The parts that still have life in them are donated to a local non-profit group that teaches bicycle repair to children, but the ones that are beyond repair are made into cool things like this bike chain bottle opener. Handmade in Oregon. Lost mine...so i bought 3 more! These things are awesome. They are cool looking and fun. They're fun to twirl as a fidget toy. They make a cool bracelet. They work great for opening bottles and cans. I bought these as groomsmen gifts for my wedding and they went over really well. I customized colors based on favorite schools. This time I bought two for me in case I lose one again and a third to add to our gift pile. The design is great! I was worried the bike chain would be to long and make it awkward to use. It is the perfect length and perfect for any bike shop to have. Great gift for a bike/cycle enthusiast! And one who also loves beer! He was very happy with it. He is going to love it!! My brother likes biking and beer, so it was a perfect combo! Well made and seems to work. Perfect gift for bike rider! As this was a gift, mailed directly to recipient, I have not yet seen the bottle opener. But the recipient was very wxcited to receive it and said that "all his bike friends would be jealous".